Over the course of the semester, I assigned 39 “Practice” WODs, or workouts that students were asked to perform as homework. Students were required to write a blog about their experiences solving the practice WODs, but were not graded on their practice WOD performance. I asked them to state the number of times they attempted each practice WOD in their blog report, and the time it took for each attempt. Repeating the practice WODs until one could complete them in the recommended time would likely be helpful for their in-class performance. The following table shows the 39 practice WODs (one per row) along with the number of attempts by each of the 15 students completing the course. (This is self-reported data from their professional portfolios). The first column lists the practice WOD names, and the remaining columns present the number of attempts made by each student. The student data appears in decreasing order by number of attempts. Thus, the left-most student made a total of 82 attempts at the 39 practice WODs . The right-most student attempted only 36 of the 39 assignments (but did two assignments twice for a total of 38 attempts). 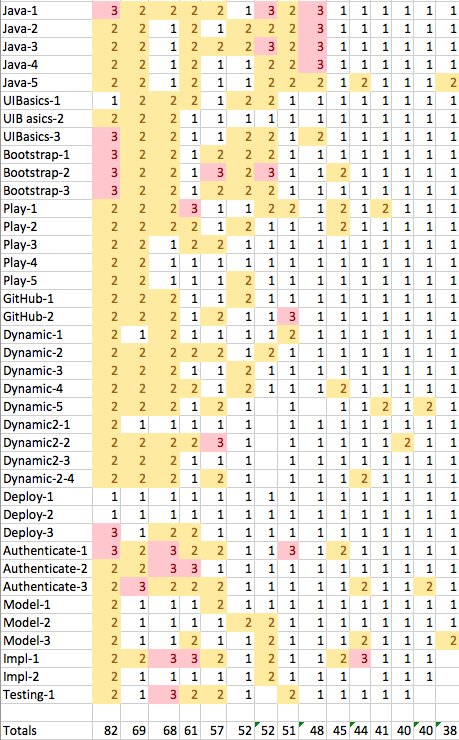 I’ve also color-coded the data to make repeated attempts easier to see. If a practice WOD was attempted twice, it is shown in yellow. If a practice WOD was attempted three times, it is shown in red. No student attempted a practice WOD more than three times. Approximately 67% of the practice WODs were attempted only once. 28% were attempted twice, and 5% were attempted three times. So, on average, the practice WODs were repeated around a third of the time. Every student repeated at least one practice WOD. Nine out of fifteen students repeated at least one practice WOD three times. Over half of the students repeated at least 30% of the practice WODs. I believe this data provides anecdotal evidence that repeating practice WODs was found to be useful by students. This conclusion is consistent with the qualitative data on WODs, where approximately 2/3 of the students said that repeating WODs was useful.